Pulav are always a welcome addition to any meal. A pulav can often make a complete meal by itself. 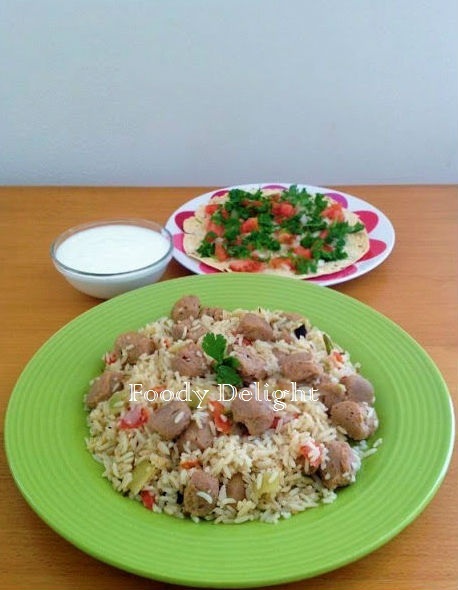 The soya chunks added to this aromatic pulao are easily available in the market and are a rich source of fiber, protein and vitamin B12 - a vitamin which is otherwise lacking in vegetarian diets. We enjoy this particular pulav with Masala Papad with makes the best combination meal. Wash the rice and soak them for 30 minutes. In a large pot, add 2 cups of water and bring it to boil. Once the water starts to boil,add soya chunks and pinch of salt. Cook them uncovered for 20 minutes. Finely chop the onion and tomato. Grind cloves,cinnamom stick,black peppercons and cardamom to the fine powder. Place the cooker on medium flame and add oil into it. When oil heats up, add cumin seeds. Fry for 20 seconds. Add grounded whole spices powder, ginger paste and green chilly paste.Fry till you get nice aroma. Then add chopped onion and fry till onion becomes soft and transparent. Now add tomato and boiled soyachunks. Mix well and fry for 2 minutes. Drain the water from the soaked rice and add it into the mixture.Fry gently for 3 minutes. Then add 2 cups of water, lemon and salt .Mix well and wait for 2 whistles. Turn off the flame.Let the steam escape out completely,open the lid of the cooker and let the pulav cool down a little. Soya chunk pulav is ready to serve. Before you add soyachunks,slightly squeeze the water from soyachunks. You can also add tumeric powder for the colour.I did not add because I wanted my pulav to be plain in colour. For more flavour, add pinch of garam masala powder. 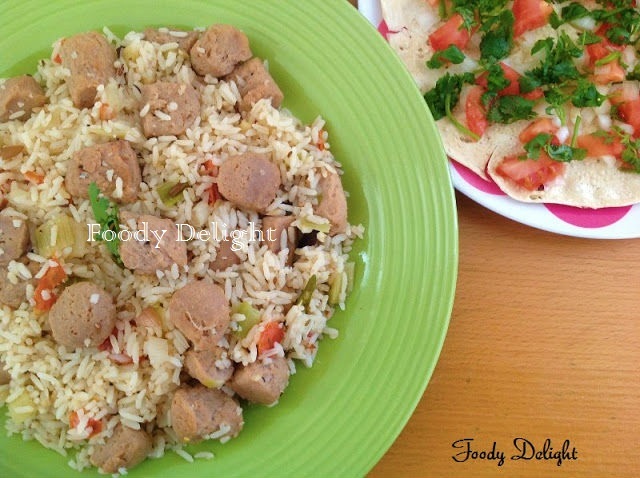 I'm quite nostalgic looking at the pilaf..My mom used to make this for us very frequently, the soya chunks used to be called 'Meal Maker' I guess it should be the brand name. A very tasty one-dish meal ! Very yummy n delicious looking pulao. Very nice pulav..looks so yummy . !